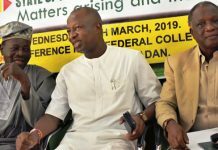 The immediate past President of the Nigerian Environmental Soceity (NES), Olu Wai Ogosu has recommended a long time approach to tackle the perennial flooding in Rivers State. Ogosu who said this in a telephone interview with The Tide said that the State needs to adopt sustained measures that will check the perennial flooding of not only Port Harcourt but other parts of the state. “The problem cannot be solved overnight. You need serious planning and investment to solve the problem. He also said that the absence of long term policies has affected the State in terms of flooding control as areas that were flooded last year are now experiencing the same problem this year. “Flood is not an environmental hazard that can be tackled immediately, because it has an accummulated impact. For instance, those living in the coastal communities require shoreline protection to check erosion. The former NES President also said that the issue of how wastes are being disposed off by the people must be critically examined as waste disposed into water channels will block it from flowing freely. According to him, people must be properly sensitised to check the indiscriminate dumping of refuse on waterways and drainages, adding that such situation is prone to create more problems. Ogosu also urged for the enforcement of urban town planning regulations to check the indiscriminate building of structures on water right of ways, stressing that structures on water right of ways should be demolished to ensure the free flow of water.